Last year, junior philosophy major Mikey Pollack paraded around campus in a red cowboy hat and an army t-shirt to celebrate Purim. This year, he isn’t even sure if he will dress up. Although the holiday usually unites students in celebration, Purim will fall on the Thursday of spring break this year, when most students will be off campus with friends and family. On Purim, Jews traditionally dress up in costume, hear the Megillah—which tells the story of Queen Esther saving the Jewish people—and enjoy grand meals called seudahs. Students at this university often join together from across campus to celebrate. Last year, the festivities were so important to sophomore information science major Maddie Met that she skipped class to attend a seudah, even though she had a test the next day. Although Met won’t be on campus for Purim this year, a small group of students plans to come back to school over the break to celebrate as a community. The Megillah will be read Wednesday night at the Hirschhorns’ home and Thursday morning at Hillel, followed by a bagel brunch sponsored by OU-JLIC. Some students, like Pollack, will make their own seudahs. Some Jewish students who are attending alternative break service trips with Hillel over break will be spending Purim in Chicago, New Orleans or Atlanta. Others celebrated before break even began. On March 7, students welcomed Adar, the Jewish month of Purim, through men’s and women’s farbrengens run by OU-JLIC. Farbrengens are Jewish ceremonies filled with eating, drinking, singing and learning. Students enjoy snacks and singing at the women’s farbrengen. Yakira Cohen/Mitzpeh. 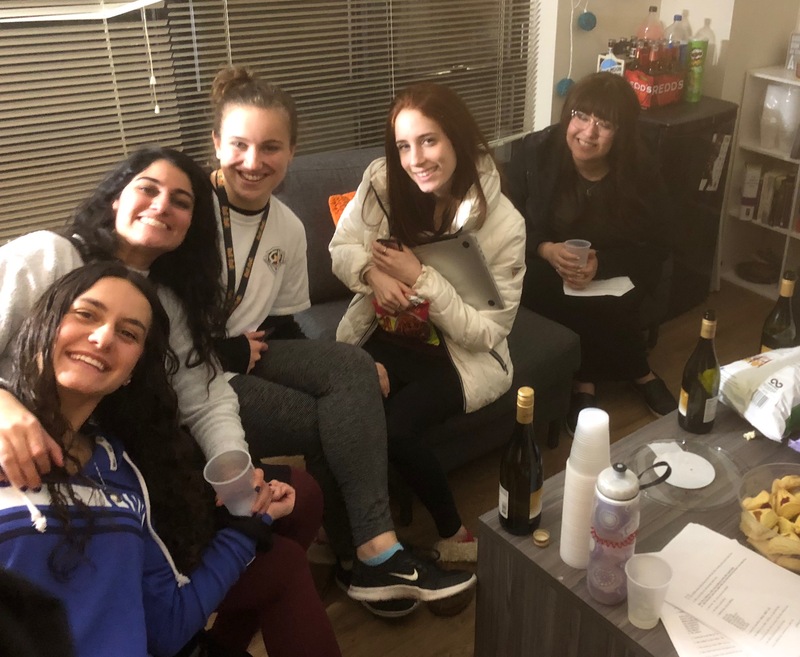 “Rosh Chodesh Adar is our way of bringing in that Purim spirit as a community,” said junior family science major Mayan Beroukhim, who hosted the women’s event at her apartment. Purim this year may not be filled with vibrant cowboy hats and army print t-shirts, but the spirit of the holiday continues. Students are still finding a way to make the holiday meaningful, wherever they choose to spend it. “Just because our school is on break, doesn’t mean our community stops. We’re still here for each other,” said Hirschhorn. No Replies to "Purim falls over break, but spirit doesn't break"